Piggyback an Arduino onto your Edison with the Arduino Block. This board features the same ATmega328P you’ll find on Arduino Uno’s, Pro’s, and Pro Mini’s. 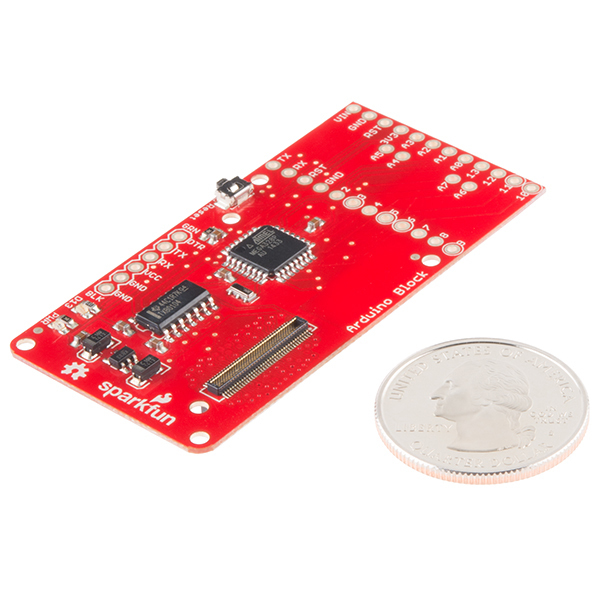 The 8-bit microcontroller workhorse is connected to the Edison via a selectable UART, so your Edison can interact with the Arduino over a serial interface. The GPIO pins of the Arduino are all broken out to the familiar Pro Mini form factor. You can jump wires off of them to control LEDs, motors, or sensors. Or connect it straight up to a Pro Mini shield.